A new dawn, with more information on the Time War, The Prisoner Volume 3, Jenny the Doctor's Daughter and some exciting Doctor Who releases. Don't miss a thing that happened in the Big Finish roundup. To celebrate Record Store Day yesterday, we have a special bundle offer this weekend only on Big Finish vinyls, showcasing two of our most popular Doctor Who stories. The Chimes of Midnight and Spare Parts are available together on vinyl for a bundle price of just £150 with free UK shipping. Each story comes in an epic four-disc LP (vinyl) set with new packaging which shows off Tom Webster’s artwork to its awesome best. Alternatively, you can order these releases individually at the reduced price of £79 each. This offer expires at midnight (UK time) on 22/04/2018. The trailer for Jenny – The Doctor’s Daughter, coming out in June this year, is available now. And you can find out more on the cast of this big adventure on Monday; what new friends Jenny will make and what adversaries she will have to overcome. Four new adventures from the time of the Tenth Doctor told by impressionist and actor Jacob Dudman were released Wednesday. The Tenth Doctor Chronicles features some familiar faces plus old enemies returning… Allons-y! Along with Jacob Dudman, Jacqueline King reprises the character of Sylvia Noble in Wild Pastures, a witty tale by James Goss. And Michelle Ryan reprises the role of Lady Christina de Souza, (first seen in the 2009 Doctor Who television special, Planet of the Dead), in Last Chance by Guy Adams. And of course Michelle is returning for her own range of adventures in Doctor Who: The New Series – Lady Christina. The artwork for the Eighth Doctor’s second foray into the Time War is here. 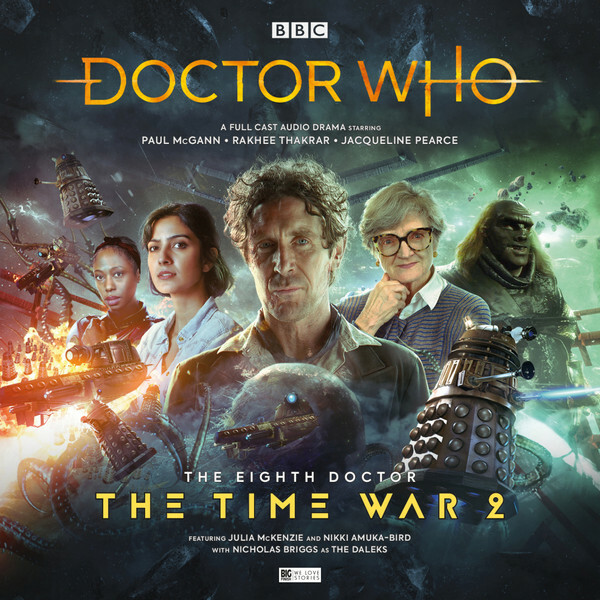 The Time War 2 sees Paul McGann’s Doctor and Rakhee Thakrar’s Bliss encounter the Twelve played by Julia McKenzie – plus there’s the return of the Ogrons! The Eighth Doctor – The Time War 2 is also one of the first releases that will feature the new Doctor Who logo. You’ll soon start seeing it appear on our other Doctor Who releases, and it’ll be the first time Big Finish releases have had the same branding as the upcoming series of the current television show. "We're really excited about this brand new look for our productions," says executive producer Nick Briggs. "It's the first major change to our cover layout since 2006, and for me it feels as though it unifies all Doctor Who productions nicely in the same Doctor Who family." The third volume of The Prisoner, the audio production based on the original 1967 ITV series in which a resigned secret agent is tested to his limits by the occupants of the Village, is coming out next year. The cult TV series is also being featured in a brand new four-part comic series by writer Peter Milligan and artist Colin Lorimer. Timed to coincide with the 50th anniversary of the first US transmission of The Prisoner, this new comic will transport readers back to the mysterious village where everybody is a number and no one is free. The Prisoner Volume 3 is available for pre-order at £25.00 on CD or £20.00 on download or as a bundle. And if you place your pre-order before the end of July this year, you’ll get a free copy of Titan Comics’ The Prisoner with the exclusive, special cover art featuring Mark Elstob as Number Six (with a small charge for shipping and only whilst stocks last). The Prisoner comic will also be available separately at £5 from the Big Finish website. And that’s the news, stay tuned for all the latest on the Big Finish site, and on our social media Facebook Twitter and Instagram.